71 percent of our Earth’s surface is water. 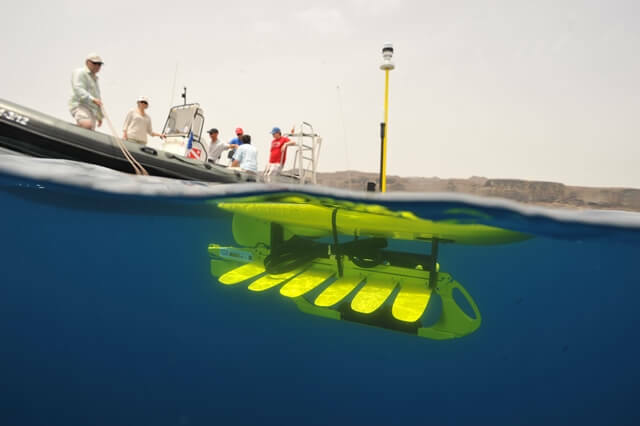 Wave Glider Technology and the data it provides can offer us a glimpse into the vast untamed aquatic landscape. Come learn about the autonomous drones capable of withstanding tidal turbulence, inclement weather, unforeseen interactions with various living and non-living obstacles all while offering defensive maneuverability, robust signal architecture, and software capable of making it all happen. Presented by Chief Software Architect James Gosling — best known as the original developer of Java at Sun Microsystems — VLAB is offered a unique glimpse into the system requirements to keep communications afloat by an engineer who comes with a background sewn into computing history. Liquid Robotics applies a modular design to its array of accessories that, when mounted to the core robotic system can physically manifest optimal wireless sensor network routing dynamically, while in constant motion — at sea. The software offers decision making for self-healing communications: should one system fail, the machines are capable of processing next-best tactical positioning for maintaining robust communication networks. The applications for the Wave Glider are extensive: defense security, detecting mines, logging and transmitting accurate seismic activity as it occurs, responding to behavioral pattern changes in ocean species, and guiding maintenance equipment as it performs mechanical upgrades to oil field equipment (to name only a few possibilities.) The Wave Glider has been aptly deemed a game changer. VLAB‘s Drone Swarms: The Buzz of the Future event will feature industry experts talking about using drone swarms on land , in the air, and by sea. Join us at CEMEX Auditorium on October 15, 2015 for a one-of-a-kind event. “How Much Water Is There On, In, and above the Earth?” How Much Water Is There on Earth, from the USGS Water Science School. Www.google.com, n.d. Web. 13 Oct. 2015. <http://water.usgs.gov/edu/earthhowmuch.html>. Chelsey Lindquist is an avid blogger with an affinity for topics related to technology and online security.